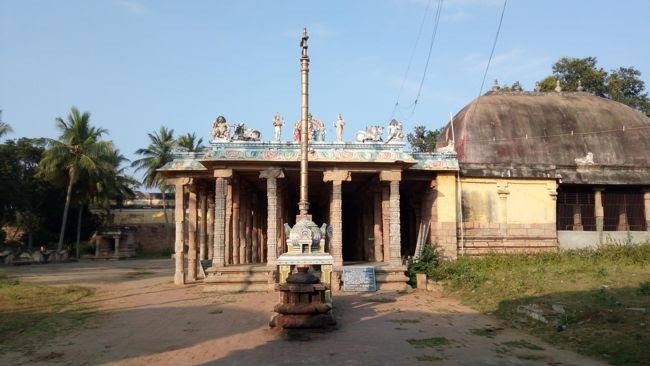 Thiruvalanchuzhi, (temple near Swamimalai) as the name indicates (thiru-sacred, valanchuzhi-right handed curve), is a holy place where the river Kaveri takes a gentle curve hugging the divine sthala to her bosom. 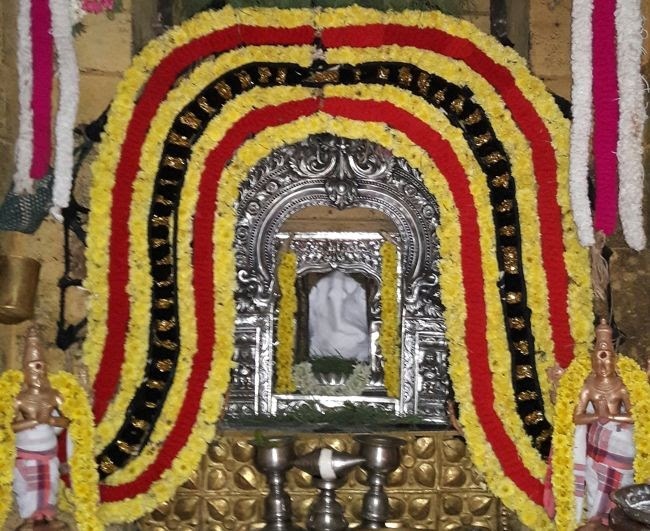 Adding glory to the place is the age old temple dedicated to the leader of ganas, revered in this sthala as Swetha Vinayagar or the Pure White one. Although it is a Siva Temple, the idol of Ganesha here is the main attraction. It is believed that this Ganesha was formed from the foam that liberated during the churning of the ocean by the Devas and Asuras. Hence it is white in colour and a Swayambhu, which means that it is self made and not sculpted by man. As per mythology ,devas and asuras were trying to churn the Thiru Parkadal using Mandhra mountain as the churn and the serpent Vasuki as the rope to extract the 'amudham', Vasuki spewed out venom thus polluting the ocean and poisoning the living beings. Unable to bear the heat generated due to the venom, devas and Asuras rushed to Lord Siva. Siva said that they are facing hardships because they had started the task without first getting the approval of Ganesha. They scooped out the white foam and made a Ganesha figure an this was worshipped by Sri Parameshwaran, Parvathi at Kailash and later by Mahavishnu and Mahalakshmi at Vaikundam, and by Brahma nad Saraswathy at Sathya logam, by turns during different yugas such as Kridhayugam,Thredha yugam. Later during Kaliyugam, Swetha Vinayagar was worshipped by Devendran and Indrani at Indra logam. Once Devendran was cursed by Akalya and to remove the curse, he had to visit the Siva kshetrangal in the boo logam (earth). He brought this Swetha Vinayaga in a golden plate along with him. He reached Thiruvalanchuzhi and wanted to worship Sri Kabartheeswarar. As he wanted to bathe in the Jada theertham, he was looking for some one to hold the Swetha Vinayagar idol, as Sri Maha Vishnu had told Indra that this should not be put down in the earth. Sri Kabartheeswarar appeared as a boy and offered to hold it for him on a condition that he will call Indra thrice and if does not appear, he will keep the idol down. Indra agreed and went to bath. Immediately Kabartheeswar in the disguise of a boy called Indra thrice and he Indra could not hear him he placed the idol in a raised platform near his sanctum. When Indra came back, he could neither see the boy nor remove the idol. He gave up after several futile attempts and finally called Viswakarma (the great architect) and constructed a beautiful Indra Vimanam (a vehicle) with intrinsic art so that he can pull it back to Indra logam with his white elephants. At that time a voice from the Heaven asked Indra not to remove the idol and Swetha Vinayagar will stay in this blessed place to protect the human kind and will be fulfilling devotees wishes. Indra was asked to visit this place during every Ganesh chaturthis, which will be equivalent to doing pooja every day. Indran was delighted at this and every Ganesh Chaturthi, he would come and perform an elaborate pooja. As per legends, river Cauvery circumbulated Lord Kabartheeswarar while entering and also exits clockwise, it came to known as Thiru Valam Chuzhi (going around in a right circle). The sanctum where Swetha Vinayagar presides is beautifully architected in granite with intricate works. The entrance on both its sides has large panes carved out of stones (could be granite or some soft granite like stone). The Swetha Vinayagar idol is pure white and is placed in a silver and gold mandap. No abhisheka or flowers are offered to the deity, obviously as the idol is made up of soft white foam like material. Every decoration and splendour is for the surrounding frames alone. The only offering is Pachai Karpooram (Borneal Flakes - edible form of camphor derived from plants and extensively used in sweets), which is finely crushed and sprinkled over the idol. 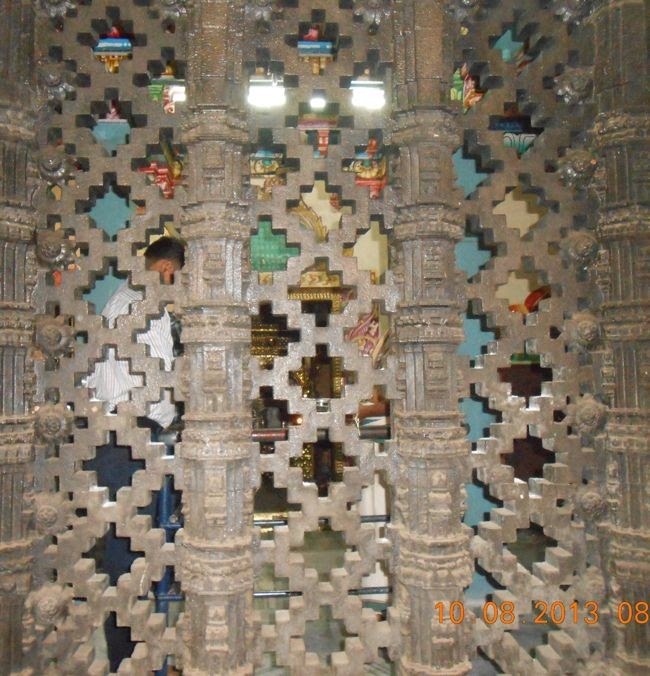 The stone pane in front of Swetha Vinayagar is called as 'Karungal Palagani' (Stone window) which is beautifully carved and has four pillars and hundred and eleven holes. This has many religious and spirtual meanings which is beyond the scope of writing. It is said whenever Kanchi Maha swami (Paramacharyal) used to visist this temple he used to sit beside this Karungal Palagani and admire its beauty each time. 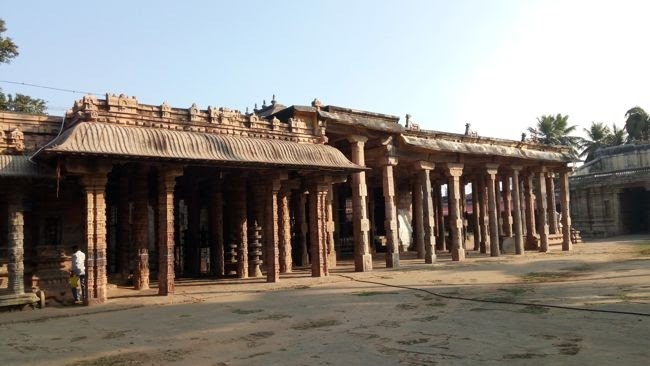 The mandapam next to the sanctum is called Gayathri Mandapam, with 24 beautifully carved pillars with intricate designs, depicting the 24 akshars of the Gayathri manthram. It is beleived that sitting in this mandap and chanting Ganesha gayathri mantra will bring you releif from all the difficulties in the life, and you will be blessed by Ganesha with all prosperity. The cream idol, adored as Vella Pillayar, Swetha vinayagar or Nurai Pillayar, in the sanctum is pure white and is protected very fiercely by silver and gold frames. Sakkara pongal (sweet rice with lentils) and modakam (stuffed sweet dumplings) happen to be the predominant naivedyam in the temple. 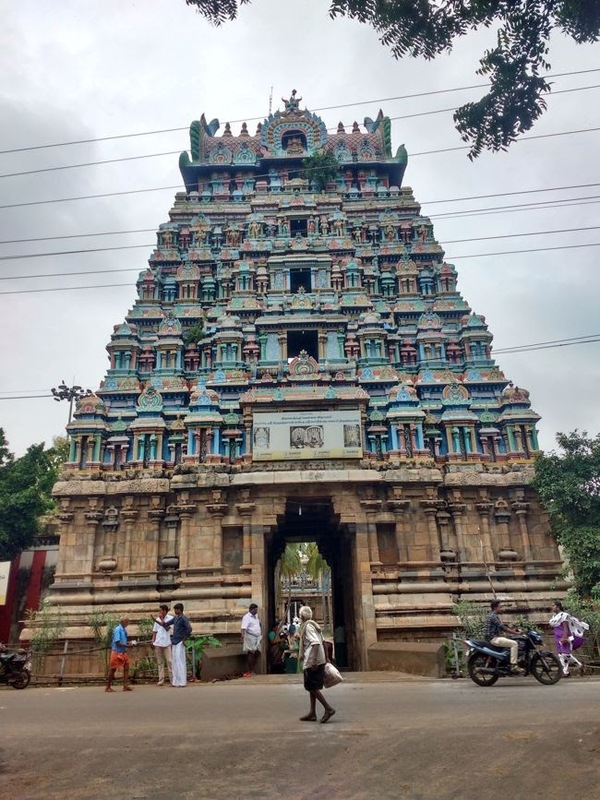 Swetha Vinayagar Temple (Vellai Vinayakar Koil) is a Hindu temple situated in the village of Thiruvalanchuzhi (also spelt as Thiruvalanjuli) near Swamimalai in Kumbakonam taluk of Thanjavur district, Tamil Nadu, India. The presiding deity is Kapardiswarar, a form of the Hindu god Shiva and his consort Brihannayaki. The temple is located at 4 Kms from Kumbakonam. Plenty of local buses, cabs and auto rickshaws are available from Kumbakonam.